They are ready to go off the shelf! 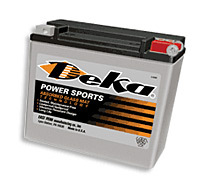 The Deka Power Sports range is aimed at the discerning customer who demands superior performance, higher reliability, and longer life with zero chance of spillage or charging spatter onto their precious chrome, paint or electronics. They are exact fitments into most Harley Davidsons as well as many other late model motorcycles as well as most jet skis and other watercraft. The Deka Seamate/RV and Federal AGM Marine/RV range of AGM batteries are specially designed for crisp engine starting and the long deep discharges typical of Marine & RV applications. The maintenance free AGM design immobilizes the electrolyte, making the batteries truly spill proof and leak proof. They are safe to use no matter how much your boat, caravan or RV gets bounced around, and the polypropylene case ensures durability in harsh environments and temperature extremes. These are a real alternative to the old fashioned splash and spill technology batteries that we’ve all had become used to over the years. The Seamate is suited for use in Boats, Caravans or Motorhomes as well as Solar applications. It is designed for high power starting and heavy auxiliary loads, and is a true dual purpose battery. Low internal resistance means strong power delivery and fast unlimited current recharging at regulated voltages. The Seamate offers a full range of case sizes and amp hour capacities, with a variety of terminal designs to ensure easy fitment. You can tell the original design purpose of batteries by their case type and terminal options, and also by observing the recharge requirements. Far from being a standby battery adapted for another use, the dry non-spillable design also meets and exceeds yacht racing Cat 3 compliance. Unlike many Asian copies, the Seamate is purpose built for both starting and deep cycle applications. Accept only the right product for the job.